As we near the end of May, and the beginning of summer, we have 4 more fun May Penguin mysteries with crafts, cats, and a bit of history-Seams Like Murder: A Crochet Mystery by Betty Hechtman, Murder in Morningside Heights: A Gaslight Mystery by Victoria Thompson, Murder at Lambswool Farm: A Seaside Knitters Mystery by Sally Goldenbaum, and Catch as Cat Can: A Sunny & Shadow Mystery by Claire Donally. Details at the end of this post on how to win a copy of all 4, and a link to purchase them. Molly Pink has been promoted to assistant store manager at the book store. She’s also in charge of special events like author signings and the Tarzana Hookers’ crochet group. Now she’s added Yarn University, a series of classes led by the Hookers. Sheila’s class is the most popular for her Monet-hued shrugs. Sheila has stage fright at the thought of teaching. A practice class should calm her nerves. Cee Cee is the unofficial leader of the group, so they meet at her place. Tony, Cee Cee’s beau, is an actor, but his soap opera was recently cancelled. He decides to become a producer for a web series. His new office will be in the apartment above Cee Cee’s garage. Since some of the videos will be about crochet, Cee Cee offers to let the women see the set up. When they get to the top of the steps, a foul odor is much more than a dead mouse—-it’s a person. It’s hard to determine if it’s a man or woman, and since the carbon monoxide detector is flashing red, it’s time to get out while they can. Molly’s ex-boyfriend, Barry, is the police detective assigned to the case. He’s pretty closed-mouthed about details although he is willing to trade information with Molly since she hears gossip and asks questions. Molly is dating Mason, a defense attorney. He was recently in a car accident and is homebound per doctor’s orders. His daughter has moved in to take care of him or maybe just to protect him from Molly. To make matters worse, Mason’s ex-wife Jaimee, one of the Housewives of…, has been released from her reality show because her life isn’t dramatic enough. To cheer herself up, she’s having work done on her house, so where can she stay but with Mason? That sure puts a crimp in Molly’s love life. Things are no better at her house where there are three dogs (Molly’s, her son’s and Barry’s), two cats (Molly’s), and sometimes the son who lives there or the one who drops in to critique her life choices. 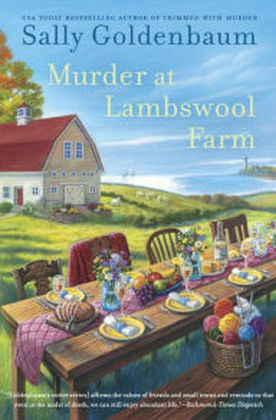 Molly’s BFF, Dinah, is considering a marriage proposal, Adele is being her usual overbearing self at the store, Cee Cee is distraught about the death on her property, Sheila is having the vapors-—it’s a relief for Molly to think about murder instead. Cee Cee’s boyfriend is arrested for the murder since his business card was found in the victim’s purse after he denied knowing her, but everyone is sure, well, almost practically sure, he didn’t do it. Although it complicates Molly’s love life to investigate Mason’s client and to interfere in Barry’s case, it’s a risk she’s willing to take. 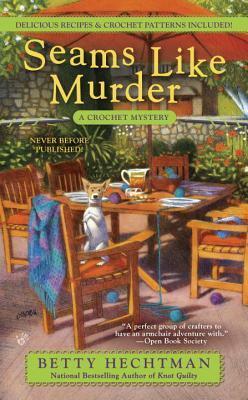 This is the tenth book in the Crochet Mystery series. Molly’s life is hectic but full with friends, family, pets, and love interests. Her job is satisfying and with each challenge, she learns more about what’s important to her and what isn’t. The book store is certainly a place readers would love to visit for the tempting treats from the bakery, the luscious yarns, or just to see Adele in costume for the children’s story time. Look for recipes and patterns for shrugs at the back of the book. The Hookers never meet without food on hand. Hechtman also writes the Yarn Retreat series. Book number four, Gone with the Wool, out this July, is available for pre-order. After Frank inherited money, he was fired from the police force. Why should they pay a man who has money of his own? He, not used to being a gentleman of leisure, started a detective agency with help from Gino, an Italian cop who never fit in with the Irish on the beat. Frank’s wife Sarah was used to having money, but not so used to giving up her job as a midwife, being more independent than most. She helps with cases where a more delicate hand is required. Maeve, their maid, decided she wanted to stay the nanny so she’s been less involved but no less interested. Even Sarah’s mother gets in on cases, much to her delight and to her husband’s dismay. The newest case is a delicate one. Abigail Northrup graduated from the Normal School as a teacher. She was then hired to teach French at the college, an unheard of thing to be done. She moved in with the college’s only female professor and another female teacher to escape the dormitories. Cornelius wants to marry Abigail but to do so would mean giving up her job. She’d rather keep him dangling. After a graduation trip to France, Abigail begins her new life. It’s more than a shock when her body is found in the school’s gazebo. The weather is cold so no one knows why she would be outdoors. Her parents are beyond grief-stricken. Her brother looks to be indifferent. Cornelius says he’s desolate, but his alibi is shaky. The police decide it was a random robbery, and that’s the end of that. Abigail’s parents hire Frank and Gino to sort it all out and to keep scandal out of the papers. Sarah is drafted to help since so many young women are to be questioned. This is the nineteenth book in the Gaslight mystery series. Frank and Sarah are settling into their marriage, Gino and Maeve are getting closer, and the detective agency is keeping them busy, although the men more than the women. It’s a new age when women want and need meaningful work too. It’s going to take a bit of getting used to for the men. For a look back in time, you can’t do better than to visit Frank and Sarah in their changing world. Birdie Favazza is the oldest of the Seaside Knitters. She decided to restore and update an old family farm, and it’s put a spring into her step to have a new interest. The crops will be organically grown, the sheep used for their wool and milk only, and visitors can enjoy a six course ‘prix-fixe’ dinner as well from local chefs. It sounds ideal. A wrong turn brings Glenn to Lambswool Farm. He’s taking a break between school and his research job. He’s a friendly guy, but somehow is withholding his real motive for being at this particular place at this particular time. It’s time for the farm’s grand opening. It looks like everyone in town will be there. The chefs are outdoing themselves with the menu. The farm’s best produce, roasted veggies with chimichurri, aioli or hollandaise sauces, spinach pie, and cheeses are just part of the meal. It’s a wonderful, successful evening until Alan, the local doctor, dies sitting at the table. Nell was next to him. He’d felt bad for several days, but typical doctor, brushed off any concern and concentrated on his patients instead of himself. Birdie is distraught, not just at the loss of a long-time friend but worried it might be something he ate at the dinner. When it’s discovered he was murdered, no one can think of any suspects. Alan was well-loved. Of course, he was arguing with his partner at the clinic. She wanted to expand the building, and Alan felt it should be left exactly like it was in his grandfather’s and father’s time. And he fired Garrett who worked there but refused to tell anyone why. Then there’s Glenn. It’s not that anyone has anything against him, but given a choice, a stranger would be a better choice as murderer than someone you know. Every Seaside Knitters book is like a visit home, no matter where you were born. Nell, Izzy, Birdie, Cass, and the others welcome newcomers. They’ll teach you to knit, fill you with good food, and treat you like one of the family. On Friday nights, you’ll wonder why you aren’t at Nell’s as Ben grills and makes cocktails. This is book eleven in the Seaside Knitters series. Each book adds a new character to the cast. For easy reference, there’s a list at the front of the book to explain who’s who and how they are related. At the back of the book, find a pattern to knit a felted bowl and how to grill Nell’s shrimp, pineapple and red pepper kabobs. This is such an enjoyable visit to a place you’ve never been, readers can only hope the series goes on forever. Sandra Murphy lives in the shadow of the Arch, in the land of blues, booze and shoes—St Louis, Missouri. While writing magazine articles to support her mystery book habit, she secretly polishes mystery books of her own, hoping, someday, they will see the light of Barnes and Noble and a Kindle. You can find several of Sandra’s short stories at Untreed Reads including her newest, “Arthur,” included in the anthology titled, Flash and Bang, available now. Look for Denali, in the anthology Dogs and Dragons. Winter is slow season for tourists in Kittery Harbor, Maine, making it the perfect time for Sunny Coolidge to work on updating Maine Adventure X-perience’s travel-booking website. Neighboring Kittery Harbor Fish is not able to take advantage of the slowdown, and Sunny worries that Neil Garret’s dwindling business will become yet another casualty of rotating closures. That would be a tragedy for Sunny’s roommate Shadow, a feline who routinely hitches a ride with her in order to snack on Neil’s treats. A distraction arrives with Abby Martinson, whose mother is dating Sunny’s father. Mike Coolidge has no problem volunteering his daughter for a little chauffeuring, but she is alarmed by the series of events that seem to follow Abby’s arrival. A dead body in the fish market’s freezer, Abby’s recognition of Neil as someone who should not be walking free, and a U.S. Marshall in town, all have Sunny’s instincts as a former reporter on full alert. Sunny’s journalist experience grants her the ability to interview and investigate suspects who range from bikers to connected members of the “Family.” She manages to test the patience of her boyfriend, Chief Investigator Will Price, but he has his own hands full handling the brassy federal agent. While she’s playing coy on the target of her assignment in Kittery Harbor, she’s not shy about her intentions towards Sunny’s boss. Always in the background is Shadow, whose mission to monitor Sunny derives as much as self-interest in protecting his food source, as in any actual affection. 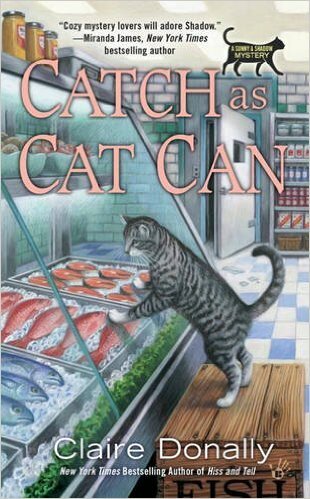 This continues to be an extremely well-plotted and grounded mystery series that seamlessly incorporates the occasional viewpoint of a feline. Shadow remains very much a cat, and his thoughts concerning humans are about what one would expect. Sunny herself is an engagingly intelligent and witty heroine with a very New England sense of practicality. The writing is sharp and funny, perfectly depicting a cat’s superior attitude. The humor is matched by a grounded mystery that speeds towards an exciting conclusion. Even the feline-phobic will thoroughly enjoy this entertaining and very fun series. To enter to win a copy of all 4 books, simply email KRL at krlcontests@gmail[dot]com by replacing the [dot] with a period, and with the subject line “crafts,” or comment on this article. A winner will be chosen May 28, 2016. U.S. residents only. If entering via email please include your mailing address, and if via comment please include your email address. More great reads! Thanks for the chance to win! What a great giveaway! All four are great authors and they write great series. Looking forward to reading. These books sound awesome! I have added them to my list. Thank you for the chance to win. New authors and previously read authors —- I’d love, love to win these!!! Lovely books and a wonderful opportunity. Each of them sound like books I would love to read. What a great giveaway, thanks for the chance! Thank you for having such a nice giveaway and a chance to win! Looks like really great reads. Victoria Thompson’s books are the best! Looks like 4 awesome reads to add to my TBR. Thank you for sharing. Some are new-to-me series! Awesome selection! Would love to win these for my mom’s 80th birthday present! Thank you the list of new books. I have been searching for something new to read. I love the variety of this set: crocheting, knitting, traveling to a different era. I have all these on my ‘must read’ list…so fingers crossed! oh my there are some awesome sounding books here..all are new to me authors..hmm how did I not know them? 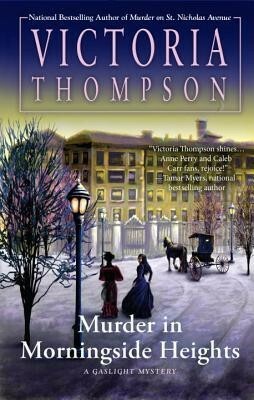 Just started Murder in Morningside Heights — Victoria Thompson always hooks me in before I finish page one! I would love to try the others! Murder in Morningside Heights was full of twists and turns – a great read – thanks for the opportunity to win a copy!! Thanks for the chance to win your novels! Two favorite authors and two new ones. Thanks for the chance to win. Sounds wonderful…everything looks wonderful and the review is fantastic. So many great books!!! Awesome giveaway!! Cats or food in a mystery??? I LOVE it!!!! !